Images and copy for you to use to promote the summit! I am so thrilled and thankful to have you as part of this event! Below you will find a TON of images, copy, and other media to help you promote the True You Summit. Just right-click any of the images and “Save Image As” to download a copy on your computer. First off, if you would like to earn commission from selling any summit upgrade packages (this is totally optional) be sure to click the ‘Access Affiliate Portal Here’ button and register to get an affiliate link for you to use while promoting the event through email and social media. The affiliate link provides a unique identifier that drops a cookie on a summit attendee’s browser and keeps track of when the convert so you will earn a 20% commission on the sale. A few words about links: The main url is kind of long: https://trueyou.themodernmomsociety.com (and even longer if you use an affiliate link) so might want to consider hyperlinking it in text or use a service like bit.ly to shorten it. I’ve set up bit.ly/mmstrueyou which you are welcome to use, but it wouldn’t have your affiliate link. I will be hosting a Facebook live each day of the summit at 11 AM central to introduce the topic of the day. I’d love to have you participate as well! Click the ‘Join Facebook Group’ button below and join me there! Finally, below the aforementioned buttons is the different categories of assets available for you to use. You can click those to jump to the section you’re interested in. Please let me know if you’d like to have anything tweaked, don’t see something you need, or if you need anything additional! Be sure to use your affiliate link in any post if you’d like to earn 20% commission! I really hope to get some short promotional videos put together, but won’t be able to work on it until the week of April 22. I’ll send out an email if/when I get them put together! Copy and paste and edit as you see fit! Let me know if you need anything additional or different beyond what is below. Click on each accordion segment to get the different types of copy. I created 3 different themes around the emails and social media copy; choose which theme you think would resonate with your audience and copy and paste away! You are also welcome to cut and paste and edit as you see fit or write your own copy! Intro/Registration Email Copy Option 1: Not sure who to trust? SUBJECT: Not sure who to trust? Being a mom today is really hard. We have to juggle and parent through a lot more than our moms did along with a whole heap of judgment on top of it. Everyone has an opinion of what we should and shouldn’t be doing with our kids and you can drown yourself in conflicting information on everything we think we “should” be doing as a modern mom. But do you know what is true for you? Join me and 15 other experts at the True You Summit which runs May 6-10. In the True You Summit, we will explore five different areas of your life where you can improve your connection to your intuition and inner wisdom to help guide you on your path: Parenting, Mom Life, Authenticity, Spirit, and Mind & Body. Join us and get reconnected to your True You and get the tools you need to live a happier, more aligned, more fulfilled, and more joyful #momlife! See you in the summit! PS – as a bonus, you’ll have access to over a dozen free gifts from summit experts – e-courses, e-books, meditations, workbooks, guides, and more – so be sure to register today! Intro/Registration Email Copy Option 2: Lost yourself in motherhood? SUBJECT: Lost yourself in motherhood? #momlife not turning out as you expected? Does every day feel like groundhog day, where you need coffee to get started on your massive to-do list and wine to wind down because the kids turned drove you nuts yet again and you zone out in front of TV or social media after the kids are in bed because your brain can’t handle much more than that? You barely have time to go to the bathroom alone let alone find time for yourself… but there is a nagging thought in the back of your mind that you were meant for more. More time to pursue things that light you up. Join me and 15 other experts in the True You Summit May 6-10, where we will explore five different areas of your life where you can reconnect to your true self and what you really want out of life. You’ll get tools to build intuition and inner wisdom to help guide you on your path: Parenting, Mom Life, Authenticity, Spirit, and Mind & Body. SUBJECT: Feeling like there’s something more? Are you feeling the stress of the day to day as a busy mom, and tired of feeling depleted because of the daily grind of taking care of everyone but yourself? Are you over the constant struggle (with your kids, your weight, your health, your relationships, your finances, etc, etc, etc) but not sure of what to do to change those things that are keeping you stuck and unfulfilled? Feeling like there has to be more than the groundhog day of #momlife? The truth is that even though #thestruggleisreal for you, it is there to teach you something about yourself. There is a path that will get you where you want to go: your true you. Join me and over a dozen other experts at the True You Summit which runs May 6-10. In the True You Summit we will explore five different areas of your life where you can improve your connection to your inner wisdom to help guide you on your path to your true you and shift patterns of stress, overwhelm, and discontent: Parenting, Mom Life, Authenticity, Spirit, and Mind & Body. I hope you’ll be joining me and 15 other experts over at the True You Summit! If you’re struggling with stress and overwhelm, not sure what information or who to trust, or if you feel like you’ve lost yourself in motherhood, you’ll definitely want to get access to this free event which starts May 6-10. But if you’re anything like me, every day starts with the best of intentions but often I blink and it’s 10 PM. Things like listening to summit interviews often fall off my radar and don’t happen as I had hoped. I would hate for you miss out on any of these amazing interviews – I can tell you that each presentation is loaded with numerous “aha moments” that could make a big difference in your experience of motherhood and in your life in general as you get reconnected with your True You. The $29 and $59 prices will go up to $59 and $89 respectively at the conclusion of the summit, so if you think you’ll miss a presentation during the free 24 hour access period, you’ll want to listen to the interviews again later, especially down the road when your soul journey takes another turn and new challenges are presented, or you want to be able to download these sessions to your computer or phone to listen while you’re running around like the busy mom you are… be sure to get your summit upgrade package today! Hope to see you in the summit! Join me and 15 other experts at the True You Summit which runs May 6-10. 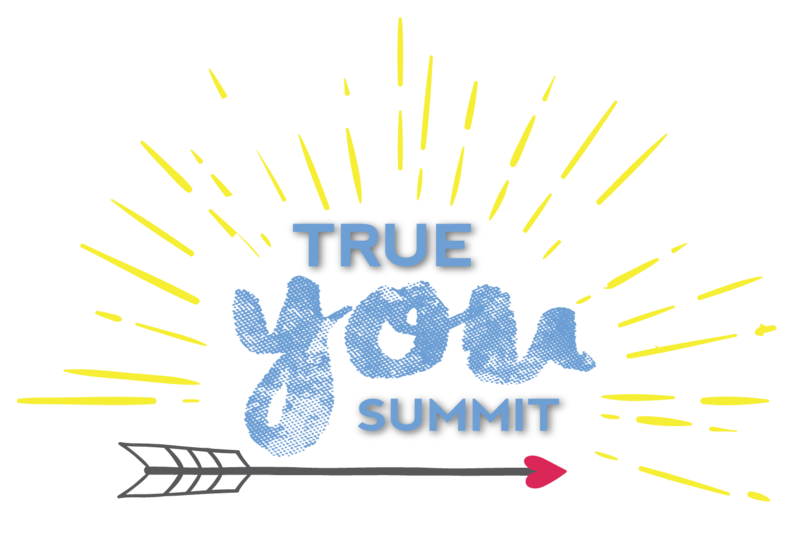 In the True You Summit, you will learn things like how to develop your parenting intuition so you can trust your gut instincts, how to let go of the people pleasing, mom guilt, and comparing yourself to others, using your body as a tool to determine what is aligned as it relates to eating, exercise, making decisions, and learning more about what’s true for you, and much more! Are you feeling the stress of the day to day as a busy mom, and tired of feeling depleted because of the daily grind of taking care of everyone but yourself? You barely have time to go to the bathroom alone let alone find time for yourself… but there is a nagging thought in the back of your mind that you were meant for more. You are. You are meant for more: More joy. More abundance. More time to pursue things that light you up. Join me and 15 other experts in the True You Summit May 6-10, where we will explore five different areas of your life where you can reconnect to your true self and what you really want out of life. In the True You Summit, you will learn things like how to find your purpose, why putting yourself first is not selfish and is actually a great thing for your whole family, ideas for how to create time for self-care and pursuing your passions, and how to let go of the people pleasing and learn to create and hold healthy boundaries and live from an authentic, aligned space, and much much more! Are you over the constant struggle (with your kids, your weight, your health, your relationships, your finances, etc, etc, etc) but not sure of what to do to change those things that are keeping you stuck and unfulfilled? Feeling like there has to be more than the groundhog day of #momlife? In the True You Summit, you will learn things like how to see discontent as a pathway to guide you towards your truth, how to surrender and really let go of trying to control all the things, especially those things you’re constantly spending time and energy worrying about, what you can learn about yourself through parenting, what your food, body, and health struggles are really are there to teach you, what your soul wants you to learn about your truth, that perfectionism can keep you from experiencing your true self, and much much more! I’d like to invite you to a free online event, True You Summit which is May 6-10! The True You Summit’s goal is to give you the tools and resources you need to live a life in alignment with what your body, mind, and soul desires; to help you uncover and achieve what you really want out of life, remove obstacles that keep you stuck in unfulfilling circumstances, and create time to pursue your passions and things that bring you joy above and beyond your role as a mother. Here are some hot hashtags that relate to the summit content to use in your Instagram and Twitter posts! Be sure to follow and tag @themodernmomsociety on Instagram! Here are the assets specific to each expert! Right click any image and select “Save Image as…” to download a copy to your computer. For Audiogram (which is a short snippet of audio from your interview overlaid on a graphic), you can either click on the three dots in the lower right hand corner of the video to download the video file or right click on the video to get the url for the video that you can embed. Why putting yourself first is important to being your true you, why it’s great for the whole family, and how to actually make it happen!